or Even After One Day? If yes, perhaps we are alike. I studied hard for one year, but got only 20% in GRE Verbal. Now discover how you also can overcome this problem for your high percentile in GRE. As you can read on the magazine page above, Ayush says, "So, this time round, I devoted all my time to English and that's what made the difference". What it means that it is not enough to work hard but you have to work HARD-SMART. What it means is that you have to work hard, but with right focus in the right direction, and using the best support available to maximize the results in the limited time you have available. 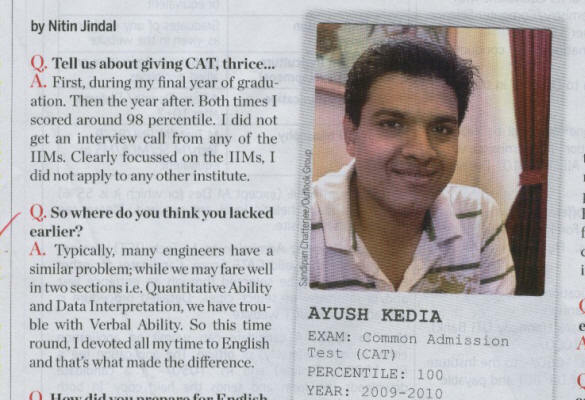 For example, Ayush Kedia is the same person who took CAT exam 3 times, failed 2 times, yet topped the 3rd time. How is it possible? Is he an ordinary person or a genius? Only after failing 2 times, he realized that the way to work hard-smart is to focus just on "Verbal Ability". During my B.E. studies at BITS Pilani, I needed to prepare for the GRE exam to go to USA for higher studies. I had realized myself and others had also told me that vocab is difficult, but I told myself, "I am different. I am special. I'll be able to score at least 70% to 80% if I work hard for one year". Even though I am pretty smart and studied hard, made sacrifices, I got only 20% in verbal on my GRE exam. I felt frustration and even humiliation and I honestly almost gave up the dream of going to USA for higher education. That's when I made it my mission that if ever I succeed and get a chance, I will develop something, so students can learn better and faster without having to go through the pain and frustration that I had to face. Finally I did become good at English and did go to USA and worked there for almost 7 years. I worked at many companies including the world famous Intel Corp. I co-authored a bestselling book on computers published by MacMillan. While working at Intel, I even flew in a small 4-seater airplane for a business meeting from Silicon Valley in California to Oregon and back. Finally, now, you can benefit from the newest version of our mind machine: Super IQ 7. It may surprise you that GRE tends to test you for meanings that are not the most common meanings of words. You don't get 3 or 5 or 10 meanings and sentences that are impossible to remember (a dictionary is better if you want to do PhD on some aspects of words). I give you a short and memorable sentence fragments, so you can remember faster and better. Once students try to memorize vocab for at least a month, most quickly discover a strange fact about vocab: Though it is relatively easy to learn and memorize new word lists, it is extremely difficult to remember them after a few days or weeks. The traditional vocab methods used by various books, guides, and coaching institutes for vocabulary building include wordlists, flash cards, SMSs, quizzes, games, etc. And, they don't work well. With wordlists you get from institutions or books, you have to repeatedly read and write and even speak aloud the words to memorize them. This is a boring and tedious process and takes many many repetitions, which means there is not enough time to memorize all necessary the words. Flash cards have the same problem. SMSs, though high-tech, are totally worthless because you can only see only few words at a time and can't revise them (remember "revision is the mother of memory"). Quizzes and games seems to be interesting way, but are a total waste of time because they can't cover the needed more than 4,000 words. Quizzes are games are good if you want to memorize only a few hundred words. Even the authors of vocabulary books think their job is to give you the best collection of words. What they fail to realize is that any big dictionary contains the best collection words, but the real job here is to put about 4,000 to 4,500 important words into your long-term memory in a practical easy way so you can get high score. Only a small number of people with special natural ability and skill can memorize using the old method. That is why it falls flat. Where the mind machine helps is that you memorize in a new way that makes it easy for almost anybody to memorize the vocab 3 to 7 times faster. Here is another reason why mind machines are so great: It is much more enjoyable to learn with the mind machine because you just relax and listen to the words again and again, automatically memorizing them effortlessly. You can enjoy because you can sit down and relax and recharge your energy while you learn, whereas he traditional method makes study tedious and hard and only those who either have natural ability or computer-like discipline can succeed. Whereas with mind machine, anyone can sit back and simply relax, listen and learn vocab. It is the nature of our mind, which is simply not capable of remembering many uncommon and odd words just by reading word lists a few times and you know there is not a lot of time to revise many many many times. Most so-called experts don't know: Even the best coaching classes only give many word lists but fail to put those word lists in the long-term memory of your mind because they do not specialize in mind power and mind technologies. Many students tend to postpone memorizing vocab because it is hard. They just focus on all others things. This is the worst mistake anyone can make. So, what you should do is start vocab preparation if you have not already started, whether or not you decide to get my Vocab Builder Mind Machine. "I am using your mind machine ... is very helpful in learning words and ... permanently retain in memory." as your hear, revise, and memorize the words. 29 Program Vocab CDs: Each Mind Machine Vocab CD can be up to 70 minutes. You get 5,871 words on 29 CDs. Each Vocab CD for the Vocab Builder takes you through these 3 steps to enable you to memorize vocabulary 3 to 7 times faster. Initial "Enter the Learning State for English Vocab" about 7 minutes. It helps your body and mind to relax and enter the learning state specifically to memorize English words, so more of your natural ability and hidden talent become available to memorize vocab 3 to 7 times faster. Step 2: Memorize 200 Words in 60 Minutes? You revise up to about 200 words in Indian pronunciation, with influence of both British and American accents. About half the words are in male voice and half in female voice. For all words, you hear meanings, and for most words, you also hear sentence fragments that have been very carefully chosen for easy memorization. Both US and British spellings are shown in the printed book that you get. A the end of each Vocab CD program, there 3 minute session of "Awake and Energize", so you are ready for the next task. 4 Mind Programming CDs: To make it easy for you to memorize English vocab. Both these CDs use DAPS mind technology and have voice telling stories to help relax and “enter the learning state specifically for memorizing English words” and to program your subconscious mind for specifically achieving breakthrough performance in memorizing English words by building new empowering beliefs and eliminating any limiting belief.